I used to spend so many days with my Nintendogs. Playing with them, grooming them, taking them out for competitions... As the years passed, I abandoned them. I know they’re not real, but what I’ve done still haunts me to this day. For those of you who aren’t familiar with Nintendogs, they were a series of games in which you adopted, trained, and played with puppies. The best part about Nintendogs was that they stayed young forever. Each game had its own pack of puppies, and you would have to buy more games in order to get different kinds of puppies to walk, feed, and bathe. I had the Dalmatians, Dachshund, and Chihuahua versions. Although I had so many puppies, I can only remember the name of my first dog, a Chihuahua named Pablo. Yesterday, I booted up the game and heard the sounds of dogs barking. But Pablo wasn’t there. Instead, a growling boxer puppy wandered around the room, specks of dirt flying off her filthy body. She seemed completely disinterested in me, even when I whistled at her. A message popped up on the screen: “Did Grizzi respond to you? Keep calling her name so she can get used to hearing it.” It was then that I realized that I had abandoned this game after getting this new puppy, and she had completely forgotten her name. The game prompted me to retain her, but I decided to move on, since I had other games to check out. Grizzi completely forgot her name. RJ angrily kicks dirt at me. The only one who came when I called her name was Honey, who was really into belly rubs and pats. Like Grizzi, all of these puppies were dirty, and also hungry and thirsty. I fed them, and they all ravenously gulped down mouthfuls of wet dog food. I also gave them water, but I had no shampoo in my inventory, so I couldn’t bathe them. I felt a little better that they were at least getting some attention after all these years. Since this seemed to be one game that I hadn’t reset, I wanted to see if there were other dogs. I found a Pembroke Welsh corgi named Blake and a Shih Tzu named PT in the care of the dog hotel. The dog hotel is a place where you can send your dogs if you need room for more puppies, and it keeps your dogs fed and well groomed. I placed RJ and Blackie in the hotel so they could get better care, but they seemed depressed about it, like they knew they were going to be abandoned again. Blackie looks at me mournfully as I put her into the dog hotel. Nintendogs game prevents you from putting all your dogs in the hotel—you have to keep at least one puppy at home. I didn’t want to leave Honey in virtual dog purgatory alone, so I swapped her for PT. I also took out Blake so PT wouldn’t be alone. While I thought I had done the kindest thing for the three who had been neglected the most, I also recognized that I was condemning the other two to an endless lifetime of neglect. This game knows how to make me feel guilty over things that aren’t actually real. Still, I think the first three had suffered long enough. When I got the two from the dog hotel, they seemed aloof, unexcited to see me, almost as if they didn’t recognize me at all. Axel angrily whips around to growl and bark at me. Look at that scowl. It’s almost demonic. I wanted to see if there was any way that I could possibly improve my relationship with him, since he wouldn’t come near me. I took him for a walk and let him play in the park. I fed him and gave him water. After we got home from the walk, his attitude was better. He was playful and wanted my attention, so I pet him and gave him belly rubs. Then I bathed the years of grime caked onto his body. It seemed as if all my abandonment was erased and all was forgiven. In the end, I knew I couldn’t make a commitment to taking care of any of them. The personalities that these puppies used to have are gone, replaced with anger and sadness over their abandonment. 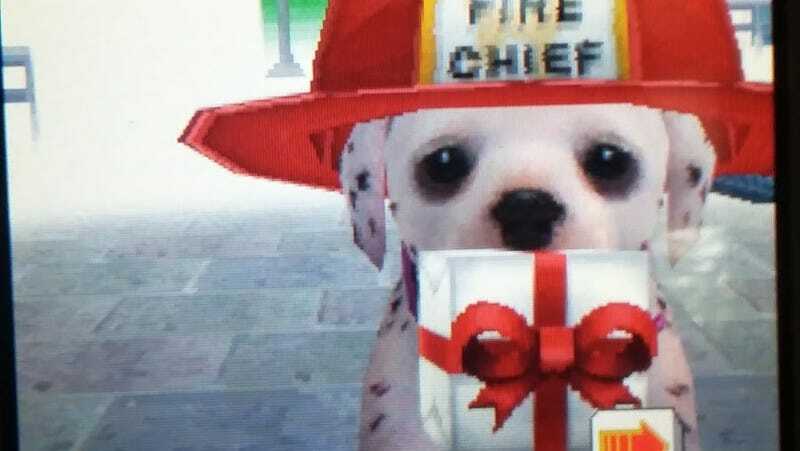 Still, revisiting Nintendogs wasn’t as bad as I thought it would be—after all, none of them had run away or were dead. Axel was quick to forgive me just because I took him out for a walk, and I’m sure the others would have done the same. It’s formulaic programming that allows them to not hold me accountable for my actions, and this reminded me that they were not real animals. I knew I wouldn’t stick around long enough to rehabilitate my Nintendogs, and besides, I already have two puppies of my own who need me. A picture of my Cairn terriers, Kiki and Elli, playing in the leaves. This was taken in 2012 by my brother Bob.